Taj-ul-Masajid, also spelt as Taj-ul-Masaajid and Taj-ul-Masjid is a 19th century mosque with a magnificent structure. Situated in Bhopal, the capital city of Madhya Pradesh, it is said to be one of the largest mosques in Asia. Previously, the mosque was used as a madrasah (Islamic school) during the day time. Literally means, 'The Crown of Mosques', Taj-ul-Masajid stands as one of the top landmarks and imposing structures in Bhopal. 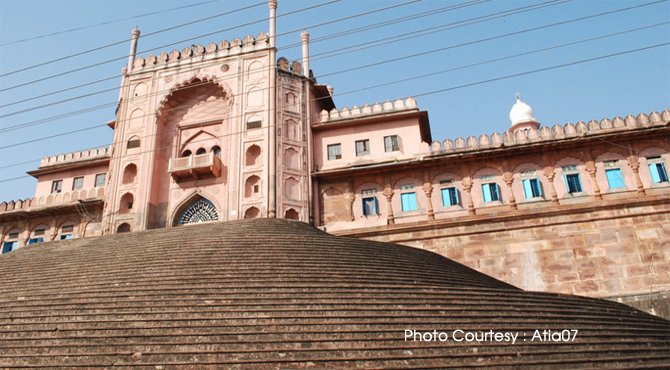 The building of this towering edifice was begun by Shah Jehan Begum, who ruled Bhopal from 1868 to 1901. But the mosque was incomplete on her death. This great queen, Bhopal's eighth ruler, left many monuments in the city and to her goes the credit for Bhopa's postal system, railways and waterworks. In those days, the cost of the this mosque worked out to 16 lakhs. It is said that the crystal slabs, designed for the floor were prepared in England at a cost of seven lakh rupees. After her death, lack of funds prevented the completion of the masjid. Later, in 1971 the construction was resumed through the efforts of donors like Maulana Luqman Elyas Nadwi and Allama Muhammad Imran Khan Nadwi Azhari of Bhopal. The 4 feet thick roof of the mosque, and other incomplete constructions were completed amounting to about 75 lakh rupees. Covers an area of 23,312 sq. the mosque is elevated above ground level and is visible from a considerable distance. The building is a pink façade topped by two huge octagonal white-domed minarets of height 206 feet height. Theses minarets provides a vantage point from where the upper lake can be viewed. It also has three huge bulbous domes, an impressive main hallway with attractive pillars, marble flooring. The most striking features of the mosque are the impressive main hall with its inter-arched rood, broad facade, spacious courtyard and smooth marble floors. A flight of stairs leads to a huge entrance from Kaiser embankment, inspired by the Buland Darwaza of Delhi. The external eastern facade ends in pavilions at the two ends that are set high on octagonal towers. Like the Delhi Juma masjid, it also has smaller square entrances from the south and north. This is open into the central courtyard with a big tank in the center for the general public. The large prayer chamber composed mainly of 12 carved sandstone pillars is surmounted by three domes covered with broken tiles. These pillars have Persian Carvings. The domes of the prayer hall are crowned with crystal finials. A three-day ' Ijtima', a congregation of Muslims in India, held here annually, draws people from all over the country.